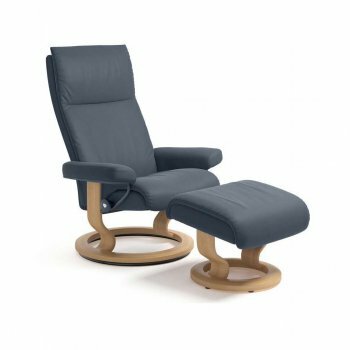 The latest Stressless design the Aura combines tall comfort with modern looks. From the moment you sit down this model has a hugging effect on the body. The simple and elegant design combined with the enveloping back and seat cushions provides an exciting and eye catching look. This recliner is available in three different sizes, small, medium and large. The 360° rotating wooden base provides unique stability and timeless design. Classic elevator ring available, providing an additional 3.5cm of height to chair or stool if required.